At Fineline Painting we offer both exterior and interior painting services for residential or commercial properties. Call us for a free estimate. Prior to applying paint to surfaces we will assess the surfaces and patch and repair them where necessary (which includes patching, sanding as well as any dry wall repairs-see below). All measures will to taken to shield personal belongs by use of drop cloths. Caulking will be applied to trim where necessary and matching colors will be utilized. We can remove wallpaper, wallpaper backing and glue. 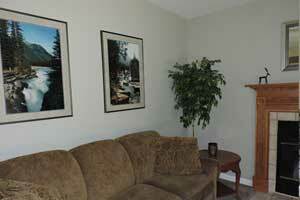 After insuring the surfaces are free of Wallpaper residue we can prep, prime and paint with a color of your choice. We professionally repair and/or replace drywall damaged by door knob holes, nail pops, water stains, wall glue, or loose drywall tape. We offer professional power washing with various PSI nozzle tips for various types of surfaces such as wood, concrete, stone, brick, aluminum and vinyl. 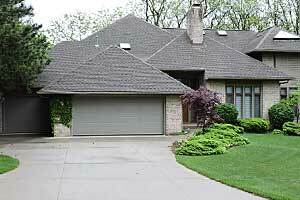 We offer gutter cleaning with our power washing service. 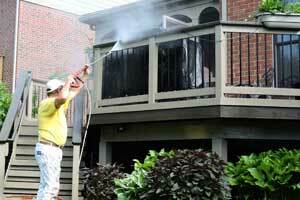 We professionally apply stain to interior and exterior surfaces like decks. Whether it be, trim, doors, floors, concrete, fences or decks. We will professional prepare the surfaces beforehand to insure quality results. We can help you decide what stain products will work best for the job. Ask about our Painting of Aluminum Siding guarantee. Now you can change the color of your home at a fraction of the cost of replacing it. While at your home we will provide meticulous clean-up. We will move and replace your furniture in the work area. We use drop cloths to reduce the accumulation of drywall dust in your home. We vacuum the work area and remove all trash relating to the job. Thank you for visiting Fineline-painting.com. Take a minute to check out our testimonials. Request an estimate from our Contact page, or call us at (734) 769-1303. HELPFUL LINKS: Explore painting and decorating ideas, paint colors and products.